The Rockstar Energy Racing squad headed to the mile high track of Thunder Valley in Lakewood, CO for this weekend's national. One of the most scenic tracks on the circuit, surrounded by mountains and very pleasing to the eye. It also has been known for extremely rutted, foot peg deep straightaways and corners. With the threat of severe storms on the horizon, the track was not watered as much as in the past. The rain ended up holding off and the track crew still kept the soil in perfect condition. Although it wasn't as deep as it is historically, the ruts were still technical enough to keep the riders on their toes every lap. Jason Anderson has been struggling with a bit of bad luck thus far this outdoor season. Starting with breaking his tailbone prior to Round 1 at Glen Helen. Then in the week before Hangtown, he got really sick but was able to shake that bug to be healthy enough to race. The problem with these ailments is not necessarily the difficulty on race day, but the lack of riding midweek. Jason has only been able to ride once or not at all between Saturday's racing. At this level it's tough to come in almost rusty feeling every weekend. It's evident in the way he has been improving so much from practice 1 to 2 and moto 1 to 2 throughout the day. Anderson has typically had issues with Thunder Valley also associated with altitude sickness. In the last couple years, he has left Colorado being very ill. That really turned around this year, as he was almost completely unaffected by the high elevation. He clearly got more comfortable throughout the day and was able to put together a solid performance, considering the issues. In fact, in the waning laps of the final moto, he actually got much stronger. Dropping 2 seconds off his lap time and making up serious ground on the riders in front of him. Not only was the lack of the altitude effect a highlight on the day, but also going into next week. He can be confident that he will have no lingering symptoms carrying over. These are very good indications that JA will land on the podium very soon. Jason Anderson: "My weekend was pretty good. I ended up going 5-5 and this is a track I usually struggle with, so I feel like we're headed somewhat in the right direction. Just going to try and go from here and keep progressing. I want to get on the box and then stay there." Joey Savatgy could easily be considered the most improved rider from Hangtown to Thunder Valley. Still dealing with racing himself back into shape after nearly a year off and fresh off a broken collar bone. While Joey showed he had the speed one week ago, he fell off the pace, dropping way back in moto 2. This weekend was a much different story. While he is still not all the way back to where he wants to be, he is much closer after just 7 days. Although Savatgy's shoulder is certainly still hampering him on these rough tracks, it is getting better as well. For the most part Joey has stayed off the ground, only experiencing a minor tip over in moto 2. 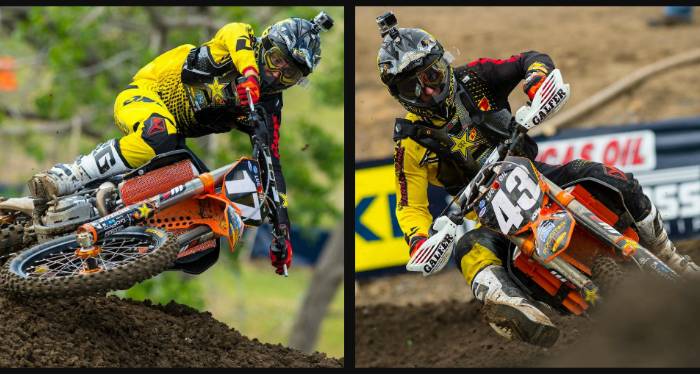 He still managed to put together two consistent moto scores for a 12th overall. Pretty impressive to finish so close to the top 10 already. Joey Savatgy: "The weekend was good. Made some improvements and we did better than we did last week. So I guess that's a step in the right direction. Overall it was good though. My shoulder is still bothering me, but I made it through two more motos healthy." The team will now head all the way east to Highpoint MX in Mt. Morris, PA. Although Anderson is still dealing with the tailbone issue, he is still going to ride more this week in an effort to be better prepared and find the podium. Savatgy will look to improve even more with two top 10 moto finishes being the goal.